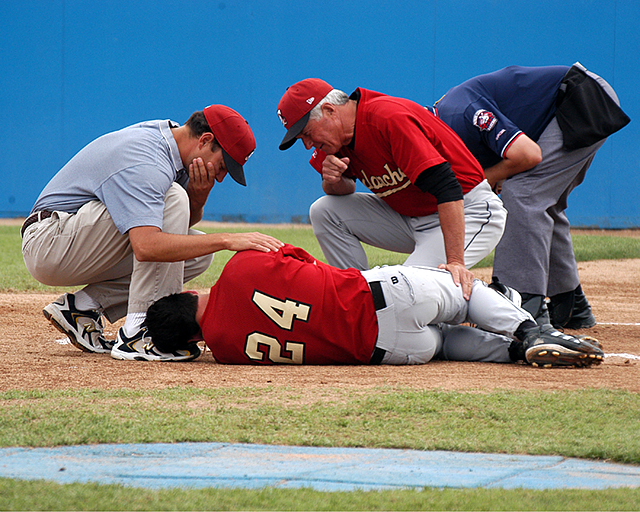 Most sports injuries are due to either traumatic injury or overuse of muscles or joints. About 95 percent of sports injuries are due to minor trauma involving soft-tissue injuries - injuries that affect the muscles, ligaments, and/or tendons, including contusions (bruises), sprains, and strains. Other injuries include achilles tendon injury, foot injuries, hamstring injuries, knee Injuries, pain in the back, pain in the elbow, pain in the groin, pain in the neck, pain in the shoulder, shin splints, etc. Persons most commonly affected: Sports Persons. Adults are less likely to suffer sports injuries than children, whose vulnerability is heightened by immature reflexes. Organ or part of body involved: Muscles, and joints. Symptoms and indications: Instability or obvious dislocation of a joint, pain, swelling and weakness. Causes and risk factors: Common causes of sports injuries include: athletic equipment that malfunctions or is used incorrectly, falls, forceful high-speed collisions between players, and wear and tear on areas of the body that are continually subjected to stress.